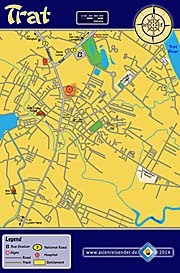 For an enlarged 'Map of Trat' click the link or on the image. The entrance gate to Wat Yotha Nimit, one of the oldest sites in Trat. Also known as Wat Bot it is a historical, royal temple which served as a place to hold the oath of allegiance. On the temple ground there is an Ayutthayan style 'wihan', a former ordination hall in which nowadays a collection of antiques is stored. 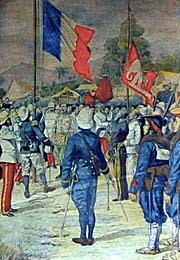 The official ceremony of the French takeover of Trat in 1904. The French flag is hoisted, while the Siamese flag with a white elephant on it is lowered. Image from wikipedia.org, common free. Thai cuisine is delicious and variable. A common dish is 'khao man khai', chicken with slightly oily rice, comming with some vegetables and a bowl of soup. Inside one of the many Thai street restaurants. 'Danggamport Residence', a historical building under conservation. 'Bang Phra Canal' in Trat, seamed by cozy looking traditional wooden Thai houses. There is a small walkway along the canal for some hundred meters. 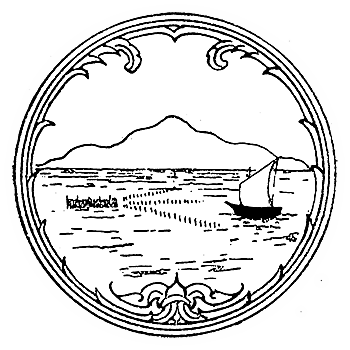 The image bottom left shows the seal of Trat. Trat is a Thai town in the east of the country, about 300km from Bangkok and 70km from the Cambodian border at Hat Lek/Koh Kong, Khlong Yai district. There is practically little or no reason for a tourist to visit Trat, for it has nothing what would be worth a visit. It's rather a stopover for tourists on the way to nearby Ko Chang, a famous island the Gulf of Thailand. Mu Ko Chang Marine National Park comprises of some 46 islands, of who some are touristic. Trat at dusk. Thai People love to go out at that time for dinner. There must be a considerably nightlife in town. When I left last time Trat, I tried to catch the first bus, what made me walking to the bus station at 4:30 a.m. Still people were sitting in some restaurants as well as in the evenings, and the fresh market was already fully busy. Trat itself with it's bit more than 10,000 inhabitants consists mostly of these pretty ugly carton-egg-style concrete buildings who coin practically almost all Thai towns and cities. 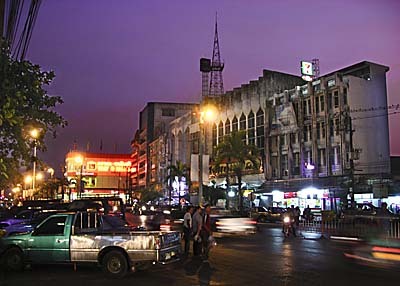 Closely around the town is Trat River, and a canal with a walkway and a lake. It's about 20km from Trat to the seaside at Laem Ngop village with some piers and a muslim fishing village where many of the typically Malay-style fishing boats are to see. From here go some boats to Ko Chang, although many tourists who come from Bangkok Suvarnabhumi Airport land in Trat Airport and have already booked transport from there to the island. National road no. 3 (Sukhumvit Road) is leading along here. It's coming from Bangkok and continuing to Cambodia at Koh Kong and there further as the coastal road until it meets Cambodias national road no. 4 to Phnom Penh (north) and Sihanoukville (south). Trat center / downtown. In the block in the middle of the photo is the fresh market placed. 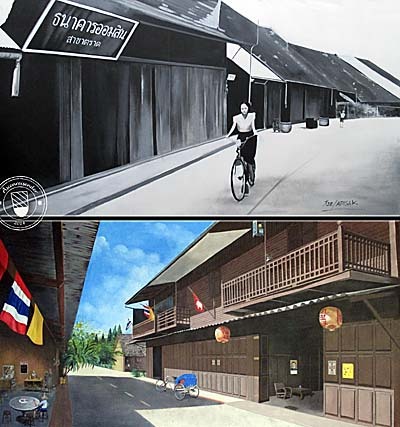 Two large wallpaintings at a building at the banks of Bang Phra, a tributary of Trat River. They show the traditional architecture, the old wooden buildings of the 19th and 20th century, before everything was covered in asphalt and concrete. The contemporary concrete buildings appeared in great amount from the 1980s on. 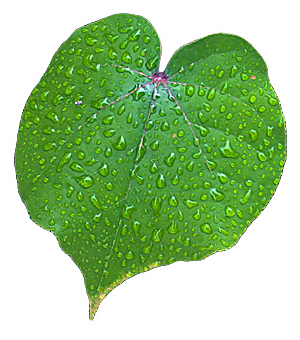 Trat's name is supposedly derived from 'Krat', what is a certain kind of tree which was cultivated around here in the times of the empire of Ayutthaya. Trat was an important seaport of Ayutthaya and it's history can be followed back to the early 17th century. In the 'Pak Nam Crisis' of 1893 neighbouring Chantabury Province was for a couple of years occupied by the French. Chantabury was exchanged with Trat in 1904, until it came back to Siam in 1906. In 1941 there was a sea battle at Trat (Battle at Ko Chang), when the Thai army attacked the French empire in Indochina. At Laem Ngop is the 'Ko Chang Naval Battle Memorial' placed in remembrance of this event. The Thai Ridgeback, a Thai dog race, is supposedly home in Trat Province. It's a watch and hunting dog, tall, quick, a good jumper and a potentially dangerous animal. However, it's not clear if the origin of the Thai Ridgeback is the island of Phu Quoc, a large Vietnamese island some 12km south of Kampot/Cambodia. In the east of Trat Province along the road to Khlong Yai is Thailand's narrowest area situated. Thailand's territory is here merely 450m wide, limited to the north by Cambodia and to the south by the South China Sea. 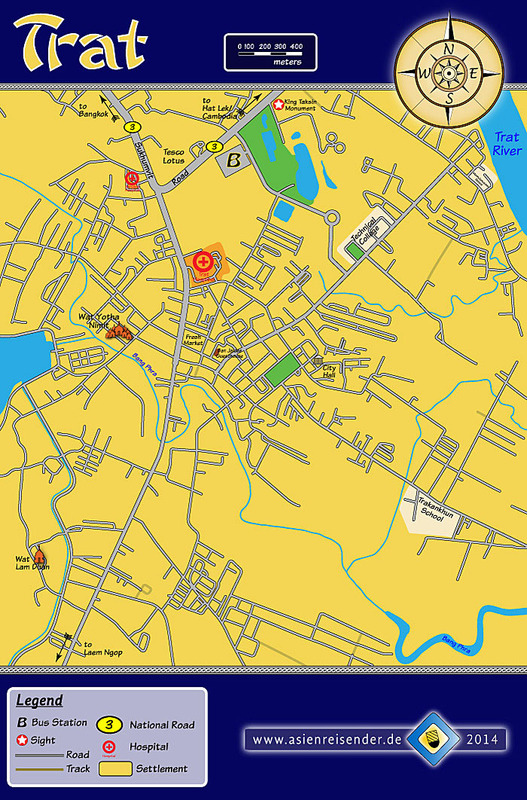 A map of Trat. As a practical hint I can recommend 'Ban Jaidee Guesthouse' in the center of town. It's a traditional wooden Thai house, cozy, very clean, spaceous and even cheap (200 Baht per night), run by a friendly Thai women. English is spoken, wifi available. Mail: banjaideehouse[at]yahoo.com. Please notice that Asienreisender doesn't get any reward or commission for this recommendation.